Today at the 9th Annual Meeting of the Intergovernmental Commission in Bucharest, the Presidency of the TRACECA Intergovernmental Commission was handed over from the Republic of Moldova to Romania, in line with the yearly rotation of the Presidency among the countries of this Commission. In her first speech, H.E. Ms. Anca Daniela Boagiu, Minister of Transport of Romania, highlighted the importance of the extension of the geographical scope of TRACECA, welcoming Turkmenistan’s possible accession to the TRACECA Multilateral Agreement, and their first participation at the Intergovernmental Commission meeting. 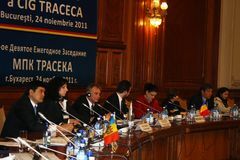 The Minister then proceeded to outline Romania’s priorities as TRACECA Presidency. Romania sees the TRACECA corridor as a bridge bringing together Europe, Caucasus and Asia, and a natural extension of the Trans-European Transport Networks to the Eastern neighbours of the EU and beyond. Over time TRACECA has matured from a technical project to an instrument for economic development of its participating countries. In the course of its 18 years of existence, the corridor has moved from being a political vision to becoming a transnational transport corridor with concrete operations and actions. In this regard, Minister Boagiu expressed her appreciation for the role of the Permanent Secretariat of TRACECA, and in particular the support of the European Commission in the form of technical assistance projects. To strengthen this acceptance, and based on the success of the first edition of the TRACECA Investment Forum in 2010 among the investment community, the Romanian TRACECA Presidency would like to see the Investment Forum become a permanent feature of TRACECA. The next TRACECA Investment Forum will take place in Brussels on 28 February 2012.